Form No. 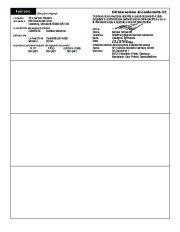 531976 Parts List & Operating Instructions for: 2010A Original Instructions Engine Stand Maximum Capacity: 454 kg (1000 lbs.) Weight: 24 kg (52 lbs.) 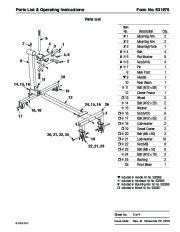 Description: Engine stand designed to support and rotate an automotive engine during repair and service. 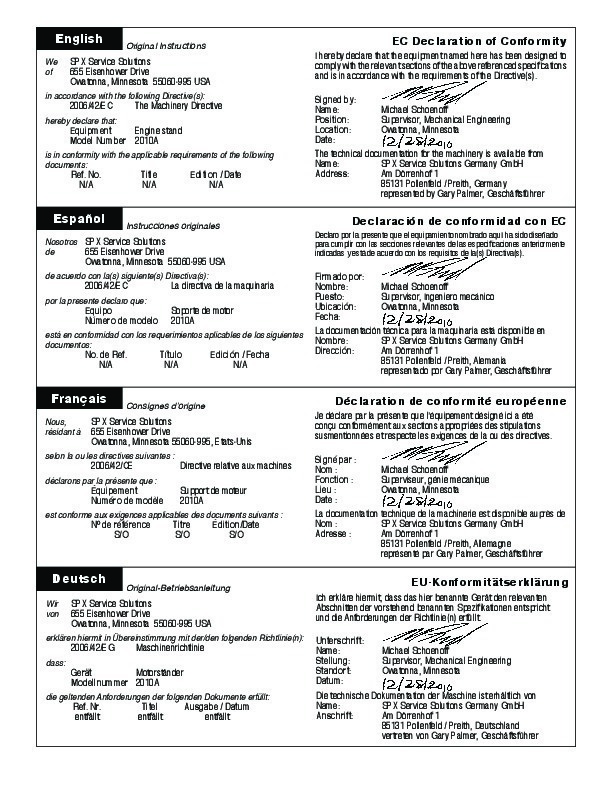 Conforms to ASME-PALD The safety signal word designates the degree or level of hazard seriousness. dANgEr: Indicates an imminently hazardous situation which, if not avoided, will result in death or serious injury. WArNINg: Indicates a potentially hazardous situation which, if not avoided, could result in death or serious injury. CAutION: Indicates a potentially hazardous situation which, if not avoided, may result in minor or moderate injury. CAutION: Used without the safety alert symbol indicates a potentially hazardous situation which, if not avoided, may result in property damage. 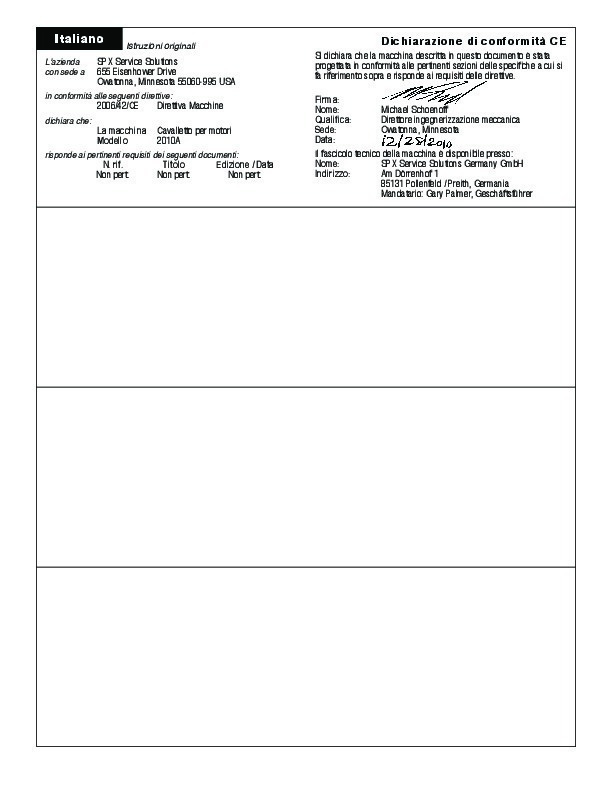 Sheet No. 2005 SPX Explanation of Safety Signal Words 1 of 4 Rev. 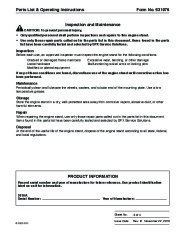 B November 22, 2010 Issue Date: Parts List & Operating Instructions Form No. 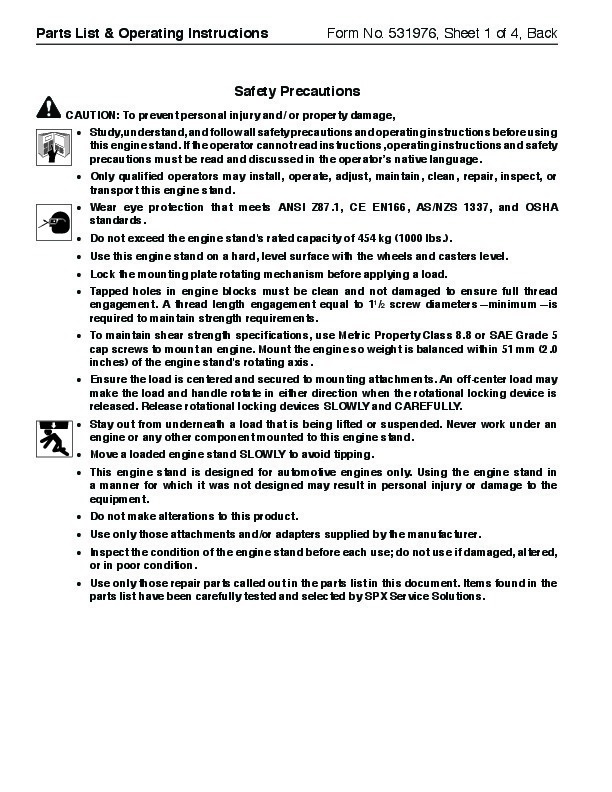 531976, Sheet 1 of 4, Back Safety Precautions CAutION: to prevent personal injury and/ or property damage, · · Only qualified operators may install, operate, adjust, maintain, clean, repair, inspect, or · · transport this engine stand. Wear eye protection that meets ANSI Z87.1, CE EN166, AS/NZS 1337, and OSHA standards. 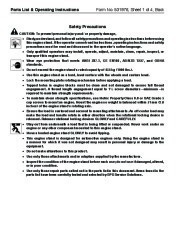 do not exceed the engine stand’s rated capacity of 454 kg (1000 lbs.). Lock the mounting plate rotating mechanism before applying a load. use this engine stand on a hard, level surface with the wheels and casters level. 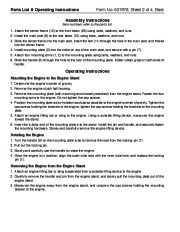 tapped holes in engine blocks must be clean and not damaged to ensure full thread engagement. A thread length engagement equal to 11/2 screw diameters–minimum–is required to maintain strength requirements. 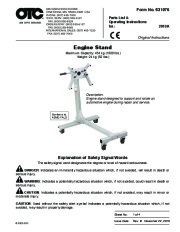 Study, understand, and follow all safety precautions and operating instructions before using this engine stand. 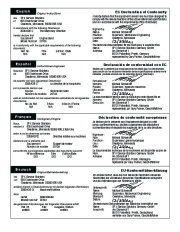 If the operator cannot read instructions, operating instructions and safety precautions must be read and discussed in the operator’s native language. · Tomaintainshearstrengthspecifications,useMetricPropertyClass8.8orSAEGrade5 · · Ensure the load is centered and secured to mounting attachments. An off-center load may make the load and handle rotate in either direction when the rotational locking device is released. release rotational locking devices SLOWLy and CArEFuLLy. Stay out from underneath a load that is being lifted or suspended. Never work under an engine or any other component mounted to this engine stand. capscrewstomountanengine.Mounttheenginesoweightisbalancedwithin51mm(2.0 inches) of the engine stand’s rotating axis. · MovealoadedenginestandSLOWLYtoavoidtipping. 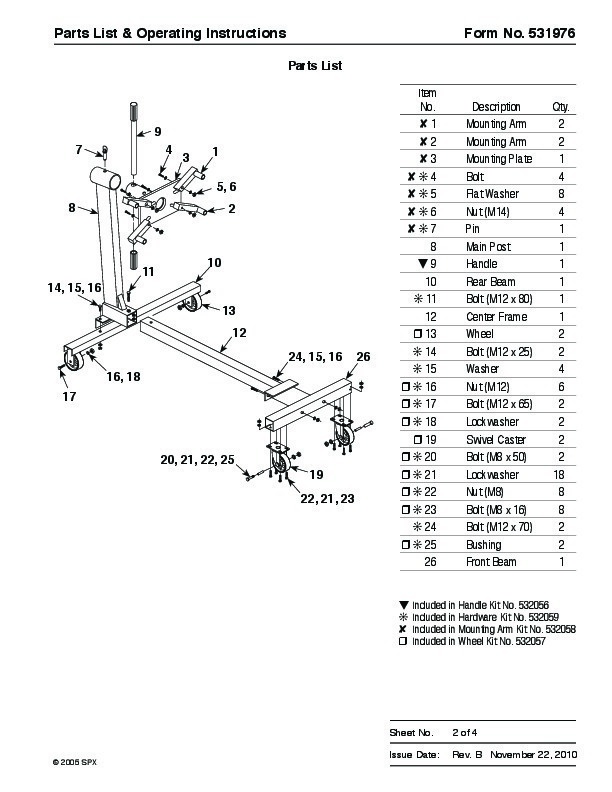 · this engine stand is designed for automotive engines only. 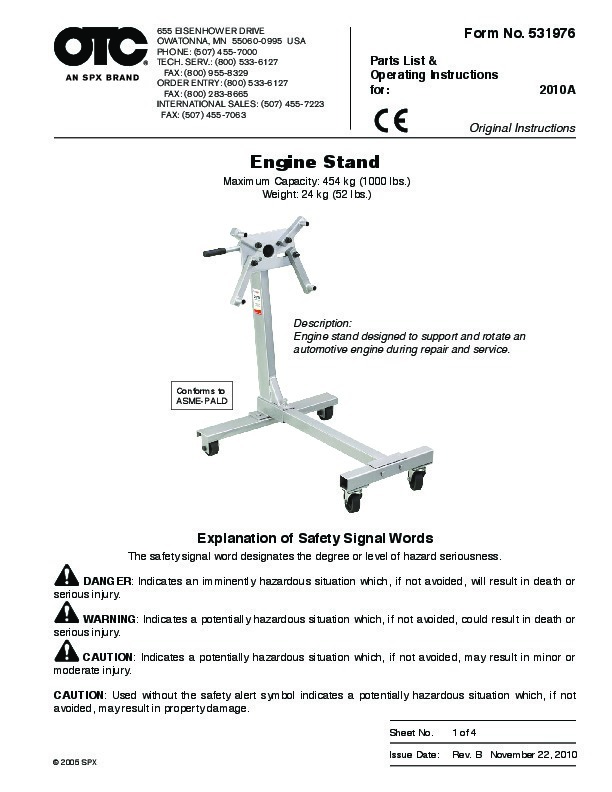 using the engine stand in · a manner for which it was not designed may result in personal injury or damage to the equipment. do not make alterations to this product. use only those attachments and/or adapters supplied by the manufacturer. 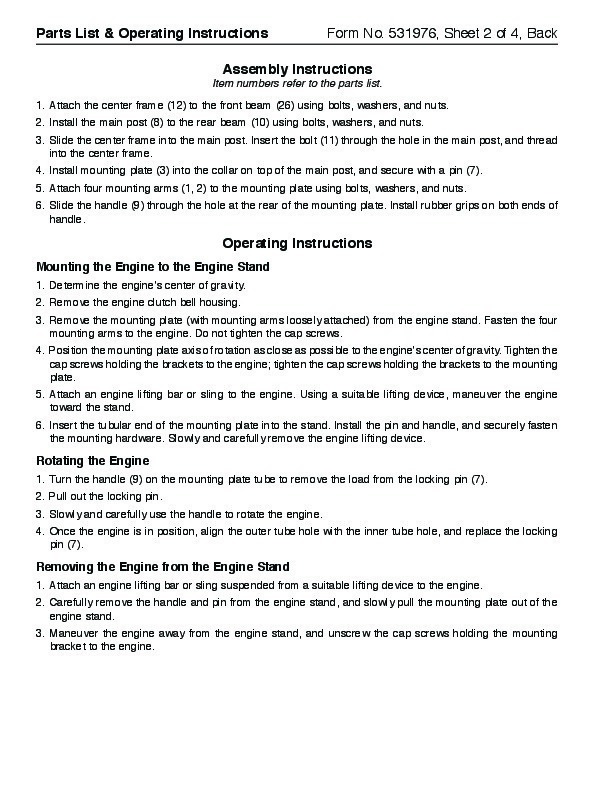 Inspect the condition of the engine stand before each use; do not use if damaged, altered, or in poor condition. 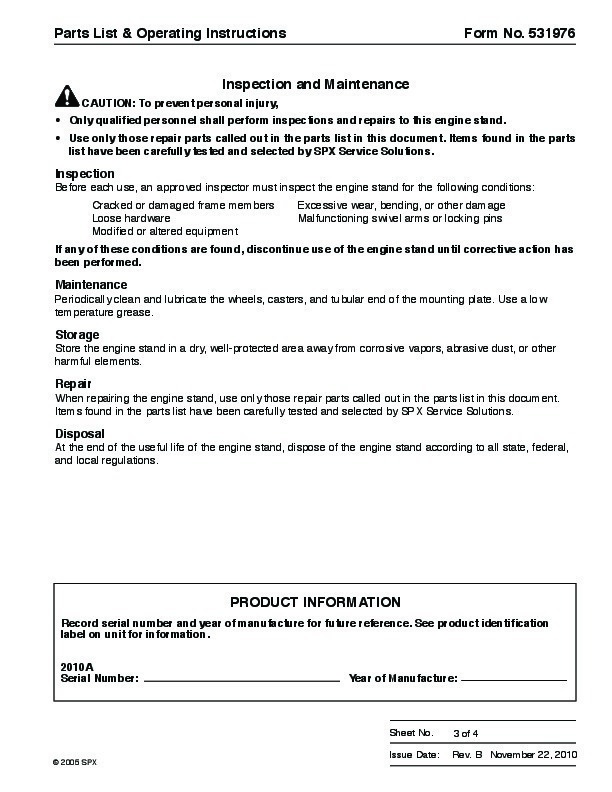 use only those repair parts called out in the parts list in this document. Items found in the parts list have been carefully tested and selected by SPX Service Solutions.